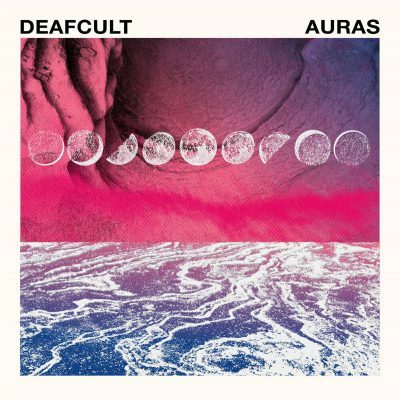 Auras, the debut album from Australian shoegaze outfit DEAFCULT, uses the lull of wistful longing and tranquil bearing to create a somehow stormy and effervescent anthology of dreamlike and illusory songs that evoke an almost thematic cascade of noise that echoes the ends of a well-spent summer, spanning 42 minutes of vivid sound. DEAFCULT’s self-titled demo tape, released last year, was an incredible first glimpse at the band and I was happy to see them follow up on it rather than blip out and disappear like so many other promising acts. The Brisbane-based sextet rely on hushed vocals and walls of guitars using delay, chorus, distortion and reverb, all the while accompanied by a bass and drum section that provides a solid foundation for the blankets of sound the band conjures up over Aura’s breathtaking 12 tracks. The album begins with “Lemonade Beauty,” the opening guitars laying the foundation for the rest of the album, sounding innocent and hopeful with just a tinge of yearning. The second track, “Secret Wisdom,” would not sound out of place following a Swirlies or Slowdive track on a nighttime-themed mixtape. These opening tracks eventually give way to the Aura’s third entry, “Summertime,” a blissful and upbeat track that shows us a happier and aestival side to DEAFCULT, showcasing the quiet-loud-quiet dynamic shifts in its bridge and chorus sections. “Sparkle,” the album’s fourth track, is an anthemic passage. Its guitars are a gentle homage to the fuzzed-out, tremolo-bending Kevin Shields. The duality of guitar players and vocalists Stevie Scott and Innez Tulloch’s twin dynamics create a brief moment of Loveless recollection as the sun-warped riffs ring out above the layer of steadily crashing drums and the other two guitar players, Kelly Hanlon and Matt Bach, alternate jarring chords, creating a warped-vinyl effect atop the surging rhythm section provided by bassist Allen McGregor and drummer Nathan Crust. “Indigo Children” is a gentle dreampop number with its gentle, reverb-laden vocals drifting listlessly above the guitar-woven tapestries made up of fuzz. Inverted drum patterns eventually cascade before giving way to Aura’s seventh track, “Stars Collide,” which begins with a delicate motif that quickly gives birth to a repetitive, drenched-sounding guitar line, like a mix between Starfish-era The Church and Chapterhouse’s Whirlpool album. The album’s single and eighth track, “Rubix,” provides perhaps DEAFCULT’s most genuine and veritable moments to date: Summery guitar play, charming lyrics, all the while still upholding the somnambulant overtones and qualities that Auras has given us. These patterned textures eventually give way to the riff-heavy “Judy,” the distorted guitars this time accompanied by synth-lines, and is a track more similar to that of contemporary shoegaze acts than the cues of late ’80s/early ’90s pioneers that dominate the related genre. “Urusai,” the second-to-last track, is a dreamlike and emotive number, drawing up the similar feelings and moods one would hear on certain Cocteau Twins and Pale Saints albums.